Very pretty card and beautifully colored sunflowers! Thank you for joining our challenge at Double D.
Lovely card Maxine, our spring is definitely here in NSW you will get it soon enough. Beautifully done Maxine! Great coloring and design ... I'm sure your friend will be thrilled with your beautiful creation! 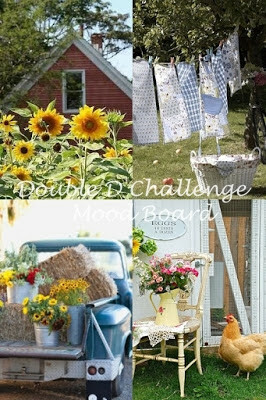 Thanks so much for joining in the fun at our Double D ‘Down on the Farm’ challenge! We hope you’ll come back often. Very beautiful. Thanks for linking up at PDE Linky Party. Such a very beautiful card. Love the colors and a beautiful sentiment. A really pretty card, who could not be in love with sunflowers! I was interested in the fact that you coloured them with Prismacolours and then blended with baby oil. Not tried this so am hoping to do so in the near future. Have just got out of hospital so I need something nice and quiet to do and this sounds perfect. I don't use my Prisma's enough, thank you so much for the encouragement your lovely card has given me. Pretty card & a beautiful quote. Great colors. Very pretty image. Love the sentiment. The watercoloured sunflowers look so great! Just one of those things that put a smile on my face today! Enjoy the week, hope you will see more flowers bloom soon! Beautiful card Maxine. I love the sunflowers and I think it looks so cool the way you placed the inscription over some of the image. Fabulous look! Beautiful! Such a pretty image and it's colored beautifully. Love the gold embossing too. Lovely card. Thank you so much for joining in the Paper Shelter Challenge this month. Hope to see you again. Great card - perfect for that image to and your embossing is so neat!! Ooooh, this is such a quiet beauty, Maxine and sunflowers are always so charming. I just bought sunflower punches the other day. I too have been thinking of baby oil and your card seems to beckon me to give it a try. Did it make the colours more vibrant as I hear that is what it does, right? Such a meaningful sentiment, too. Pretty sunflowers! This is a great card. I've long forgotten the q tips and baby oil for blending colored pencils trick! Beautiful card! Thanks so much for playing at Double D! I love this sentiment and these beautiful sunflowers! Love your pretty little sunflower panel....they're perfect! Beautiful sentiment! Thanks so much for playing along with us at the DD Challenge Blog! A pretty card, beautiful sunflowers and lovey sentiment.